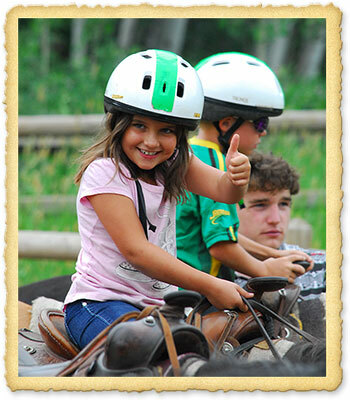 "My camp, Geneva Glen, is a place where I feel inspired to be a better person. At the end of the two weeks, I feel much better about myself, as well as much more responsible. I come home feeling like a new person. While at camp, I am happier t.han I am all year. I learn to be myself and love who I am." "Geneva Glen really means the world to me, as do all of the people there. I arrive at camp as just a girl, and I leave as myself." "I would just like to thank you for what you do for camp. I just got home from Knighthood I and I was in Cabin 5. This year was my seventh year at camp, and I can’t tell you how much it means to me that you make camp such an amazing place year after year. Knighthood, especially, the Ladies’ Program, helps me so much as a person. As hard as my life gets at times, no matter how many girls are mean or rumors spread, I know that Knighthood is there for me to help me stay strong. I have learned so much about myself and other people through the program, which gets more meaningful each year. I can’t even put into words how much I love camp, and I just wanted to let you know that. What you do for camp is amazing, and I thank you from the bottom of my heart." "The pressure is off. 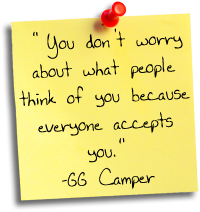 You don’t worry about what people think of you because everyone accepts you." "This is a place where everyone can be themselves, and we all are able to talk about anything to each other because we trust one another. Because camp is such a special place, so removed from our normal life at home, my relationship with camp friends is deeper and more meaningful. I trust these friends more, and I know I can talk to them about anything. We are all so close. Even people I have known for one day are as good of a friend as many of my best friends who I have known for years. People like this are hard to find, so I am lucky to have a place with so many of them." "I had hoped that my son would gain some much needed confidence and I am so pleased that indeed that happened. He was so nervous about being on his own for a week and ended up loving camp so much he did not want to come home. That is a sign of an excellent experience. Thank you." "I've got to tell you that my little girl had the BEST time ever. Came off the plane with tears in her eyes because she already missed it. We've also spent the last two nights with more tears and lots of talking about why Geneva Glen is so great....She says it's a magical place. I couldn't agree more." "We love Geneva Glen! This was my son's second year at Geneva Glen and he had such a great experience! He's still talking about all the fun stuff he got to do at camp. The other day he said, Wouldn't it be cool if we could do a parent's camp so I could show you all the fun things we do!" 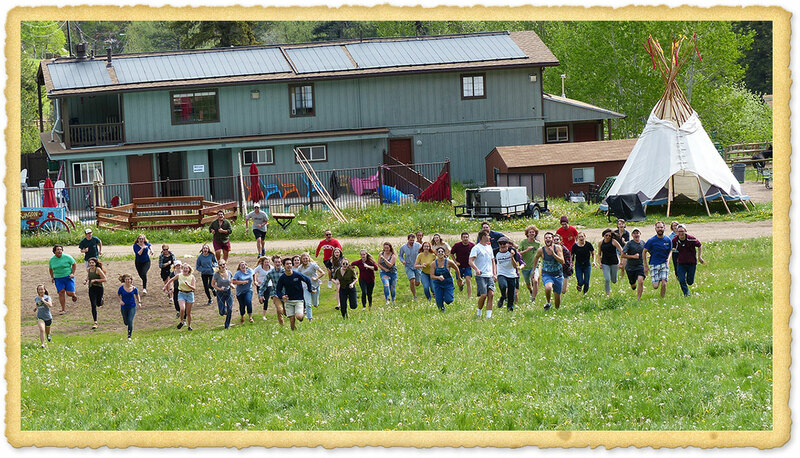 "The GG camp experience gets better every year for our daughter. The graduated levels of independence, along with the honors kids can earn from year to year, make each year more meaningful than the last. The staff, counselors, etc. are just so well-trained and sweet. And I am blown away by the number of repeat campers and counselors -- just beginning to see why you have this unique return rate." 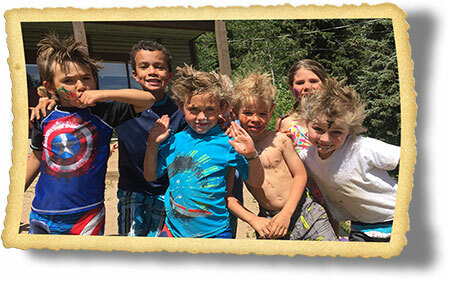 "The special atmosphere and connections that the kids experience at camp takes them all the way to the next summer- they are constantly referring to things they did at camp throughout the year and always look forward to going again." 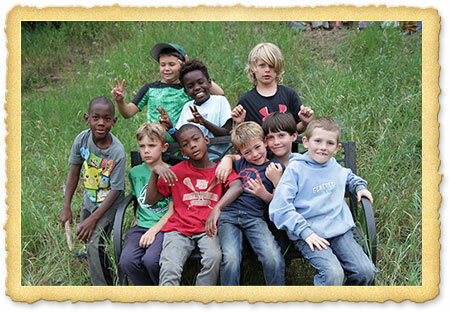 "I like that there are character traits and goals for my boys to strive to meet." "Counselors were terrific! Our son had never been to camp and had a fabulous time and felt safe. They seemed nurturing and encouraging. The camp program seems extremely well organized. He can't wait to come back." "Both my girls had, once again, the best time at camp. They truly love everything about camp and as the years go by they love it more and more. My husband and I feel so good about sending them there. The girl counselors are just great, such positive role models." "Words cannot describe how my life has been changed for the better by Geneva Glen. Coming to GG for the first time was extremely intimidating, but almost immediately I felt like I belonged here and had been here all my life. The relationships I have developed with staff and campers alike is something unique and something I will always cherish. I have learned how to be a better person, a better friend, a better leader, and a better follower. The lessons I have learned this summer are innumerable and invaluable. Thank you all for everything you have done for me and for each other. It’s not the program itself or the physicality of camp, but the spirituality and sense of love exuded from the people. Never before have I experienced anything like this and for that I am externally grateful. Thank you all. Geneva, my life has been bettered by you." "This place changed my life when I was 14. It became my home and the place where I learned who I was and why I was special. That was the summer before I entered high school, so it’s appropriate that as I enter college, I can say that this place still means the world to me. But now that’s true because I’ve started a journey of giving back to this place that gave me so much. Geneva Glen bettered my life by showing me how far kindness can go, how much wisdom a ten-year-old truly has, and how much it can mean to a kid who feels out-shined if you notice him. I hope to continue for years to come. "I’ve gained confidence, leadership skills, FRIENDS, motivation to do good; that palpable feeling that I have no choice but to be my best self. Thank you, Geneva. I am forever grateful." "Geneva Glen has been shaping the person I am today since I was a kid. 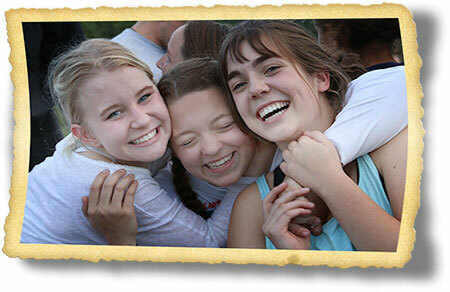 The counselors I had served as role models of the person I wanted to be, and now looking back at my counseling career, my campers were the ones influencing me with their innocent, playful, loving spirits. Geneva Glen bettered my life by bringing me back into this family with the people who are truly meant to be in my life." "Had I not come to Geneva Glen as a camper, I would not be the “me” I am now. I have been so fortunate to become someone who I am comfortable with here because of the loving and positive atmosphere that GG fosters. I would not have half as meaningful friends and would not know myself had Geneva Glen not been part of my life. My life has bettered in more ways that I can count." "This camp in only six years has defined my character, personality and morality. I see myself as a product of the spirit of the Glen, among many others like myself. It is this blooming and flourishing I now see creates such a wonderful environment and place for nurturing and growth. I can only feel honor for having been granted such a privilege."